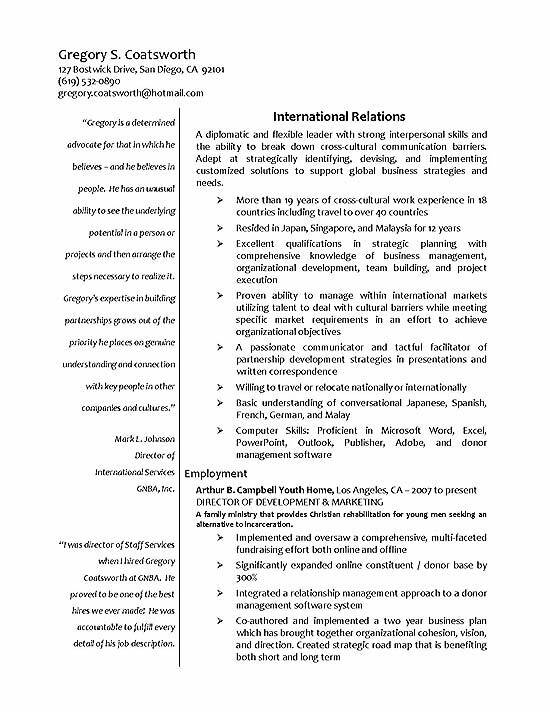 This post exhibits a resume for a professional with background in International Relations and Diplomacy. The document services as a good reference for anyone with experience in communications or international business. 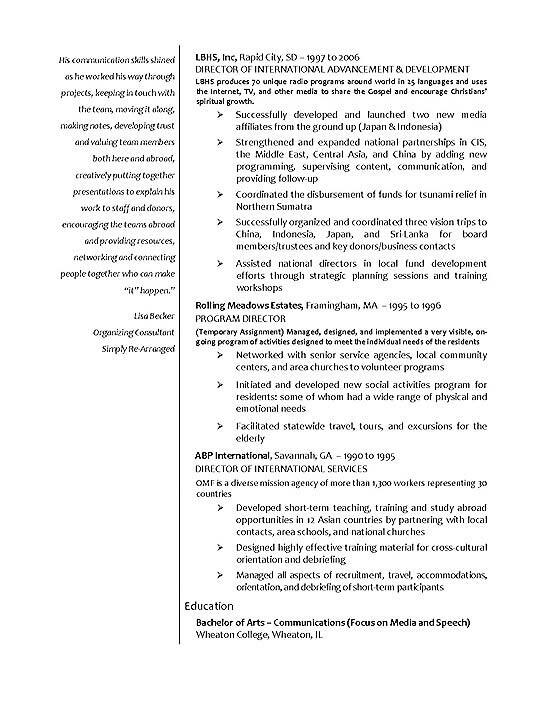 This resume uses a vertical layout with quotes about the job seeker on the left side. The resume uses a headline title to emphasize International Relations. The summary paragraph outlines key qualifications that include: Global Business, Strategic Planning, Cross-Cultural Management and International Markets. The experience section lists company names and job titles with a company description below. The bullet points provide statements that describe responsibilities and accomplishments such as expanding the donor base, integrating new software, co-authoring business plan and developing new international affiliates. The education section documents the job seeker’s Bachelor of Arts degree in Communications with knowledge of conversational Japanese, French and German languages. Expertise in the deployment of initiatives and strategies that support international business relations. Multi-lingual speaker that is fluent in Spanish, German and Japanese languages, capable of serving as liaison or interpreter in high level executive meetings. Assist in the creation of presentations, slides, power point documents or international conferences. Created new business affiliates and launched new business product line in Spanish and Portuguese markets. Coordinated with international director to developed strategic training workshops for Asian business centers. Planned and executed major business trip to Malaysia to meet with 3 directors of product manufacturing plants in order to review safety and compliance issues. Strong understanding of business, marketing, project management, strategic development and planning. Recognized for ability to work in global markets to achieve business goals. Took on initiatives to globalize corporate training procedures and quality workshops and implement programs worldwide.